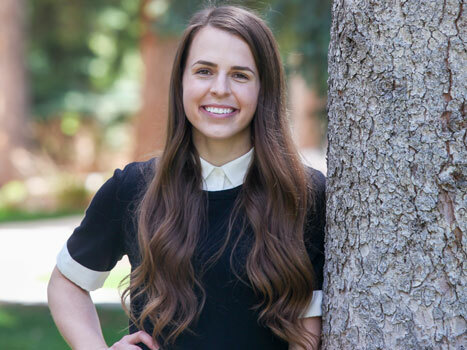 Climbing her way through school and life, Sidney Vowles from Orem, Utah, stands as an example of academic achievement as SUU's 2016 Scholar of the Year. Receiving a Bachelor of Science in Chemistry at the University Commencement held April 30, Vowles has dedicated innumerable hours to her studies and research while attending Southern Utah University. Beginning her collegiate career as a biology major, this rock-climbing Thunderbird knew she wanted to work in the medical field one day. Though her studies have consumed the majority of her time, Vowles works hard during the week so she can rock climb with friends during the weekend. On top of studies and climbing, Vowles served as the president of the Chemistry Club and helped teach science to elementary school children. Inspired by her time instructing elementary children, Vowles is looking to work with Teach For America, a nonprofit organization focused on providing quality educators right out of college to teach in low-income communities. A two-year commitment, the idea of igniting a flame within the minds of children and adolescents excites Vowles. Dr. Mackay Steffensen, associate professor of chemistry at SUU, has worked with Vowles extensively as her professor and fellow researcher. After her time with Teach For America, Vowles plans on attending medical school and training to become either an OB/GYN or to work in surgery. She hopes to help women and young girls feel comfortable with healthcare issues. Supporting her through the good and bad are Vowles’ parents, who she says are her biggest cheerleaders. SUU is proud to have such an outstanding and aspiring student represent the school as Scholar of the Year.